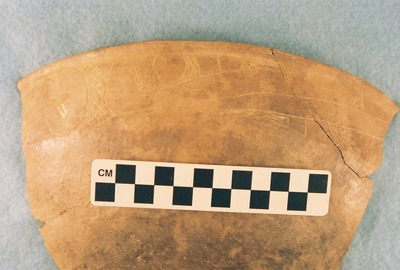 "41CP12, Burial 1, Pot 3" by Timothy K. Perttula and Robert Z. Selden Jr.
DECORATION: The rim has an engraved scroll motif repeated four times around the vessel. The scrolls are divided by cross-hatched engraved brackets. The scroll fill zones include ovals and rectangles created by cross-hatching or excising, and alternating upper and lower scroll fill zones have a unique hatched hooked arm ending.